HomeNovel Skin Patch: The Future of Antibiotic Treatment? The resistance to antibiotic medications is an ever-more prominent public health issue. This phenomenon is related to the acquisition of novel properties or adaptations that allow bacteria to avoid death caused by these drugs. Antibiotic resistance is seen in many types of dangerous microbes, and is effective against even the newest compounds that have been developed. It is thought to be associated with a number of factors, the most well-known of which is the over-use of some antibiotics, particularly the older and more popular classes of these drugs. For example, this practice may be related to the rise of penicillin-resistant bacteria. Some researchers also believe that, because so many antibiotics are intended to be taken orally, resistance may also be conferred on gut bacteria. As a result, these bacteria can be more pathogenic in the future, or even pass the genes for resistance on to other bacterial types. A team of researchers at Queen’s University Belfast (QUB) have set out to address this problem. Their project has resulted in a new type of device that offers an alternative to the oral administration of antibiotics. This team, led by Professor Ryan Donnelly of the university’s Pharmaceutical Technology group, worked on the theory that the actions of antibiotics could be enhanced if they bypassed the metabolic processes that follow taking a drug by swallowing it. These include absorption through the gastrointestinal system (which may reduce the amount of active substances for the body to work with) and first-pass hepatic metabolism (which may do the same). In addition, it avoids the risk that gut bacteria (which may or may not be pathogens) may acquire antibiotic resistance as a result of relatively high-volume exposure. Therefore, the team decided to develop a new type of transdermal patch (or ‘skin-patch’) to deliver the antibiotics. A skin patch may have advantages over a drug taken in pill form, and not just for the reasons outlined above. The oral route for drugs is not applicable to all antibiotic types, whereas a skin-patch may allow for the delivery of a greater range of these drugs. Conventional transdermal patches may allow for the gradual release of drugs over an extended period of time at precise, controlled doses, which is often also needed for antibiotic therapies. For example, skin patches are currently used to administer drugs such as nicotine or fentanyl. 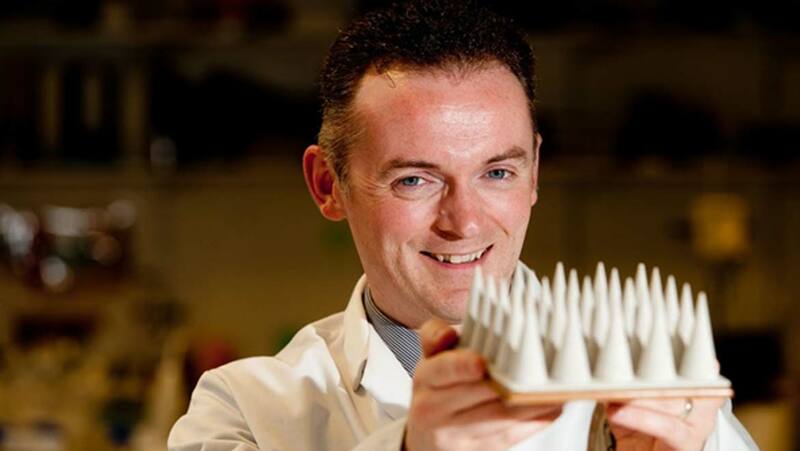 The QUB team also developed a novel array of micro-needles. This arrangement demonstrated the ability to pierce the upper layer of skin (painlessly) to deliver a potentially appreciable dose of antibiotics. Despite the term ‘micro-needle’, this novel approach to drug delivery is not made of metal or other rigid material normally associated with such a word. They were in fact made of a specially-designed, medical-grade polymer known as Gantrez®, combined with 10kDa polyethylene glycol, at 15% w/w and 7.5% w/v respectively. This allowed for enough physical robustness, conferred by some chemical interactions including cross-linking and esterification. For example, the resulting needle structures (produced using a micro-moulding process) were able to tolerate a total of 30N in compression force, applied directly from above. They were also stable at ambient temperatures, and amenable to the sterile, secure packaging required for transdermal products. The researchers were able to produce these molecular needles at a height of 600nm. The micro-needle array was applied to a surgical dressing, to which a pressure-sensing film was also applied. This process resulted in a complete device that could turn from white to red to indicate enough force had been applied to drive the microneedles to the required depth into skin. The team tested their new products on a skin-simulating product (Parafilm® M) typically used in studies such as these. This resulted in values of 500µm of microneedle insertion depth, which were favorable enough to progress to a small-scale trial in human volunteers. The researchers recruited 10 healthy volunteers (40% female) to whom 10x12 cm patches (with 16 microneedles per patch) were issued, with application instructions along the lines of those for commercially-available skin patches. The volunteers applied these to the skin of their upper arms (much as one would with a nicotine patch, for example). The researchers used techniques such as optical coherence tomography (OCT) to determine that this achieved an average micro-needle insertion depth of about 300 to 450 µm in these volunteers. The researchers concluded that their micro-needle patches achieved an appreciable level of penetration into the skin, that the volunteers were able to apply the patches properly (i.e. with enough pressure to ensure micro-needle insertion), and also that the devices were tolerable for the volunteers in the course of the study. Therefore, this new form of skin-patch may have clinical potential as a delivery system for antibiotics. On the other hand, Donnelly and his team also note that the micro-needles may need further refinements (e.g. an increase in needle length) for them to make it as a viable pharmaceutical product. All in all, these innovative micro-needles may offer a new direction in antibiotic treatment that bypass the potential risks of their normal route into the body. Ripolin A, Quinn J, Larrañeta E, Vicente-Perez EM, Barry J, Donnelly RF. Successful application of large microneedle patches by human volunteers. International Journal of Pharmaceutics. 2017;521(1):92-101. Feng H, Liu X, Wang S, Fleming J, Wang D-C, Liu W. The mechanism of NDM-1-catalyzed carbapenem hydrolysis is distinct from that of penicillin or cephalosporin hydrolysis. Nature Communications. 2017;8(1):2242.